Sticky: Embedding Videos In Posts! Sticky: Buying & Selling Tour Tickets On VHLinks! 03.11.12: Van Halen @ TD Garden - Boston, MA - PICTURES & VIDEOS! What happened to Alex Van Halen's Ludwig Rosewood 100th anniversary snare? 05.07.12: Van Halen @ Rogers Arena - Vancouver, BC - DISCUSSION/REVIEWS, etc. 06.09.12: Van Halen @ STAPLES Center - Los Angeles, CA - DISCUSSION/REVIEWS, etc. 06.16.12: Van Halen @ US Airways Arena - Phoenix, AZ - DISCUSSION/REVIEWS, etc. 03.05.12: Van Halen @ Wells Fargo Center - Philadelphia PA - UPDATE & DISCUSSION! 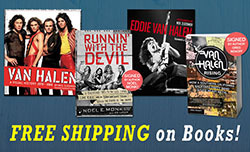 03.24.12: Van Halen @ Boardwalk Hall - Atlantic City, NJ - PICTURES & VIDEO! 04.20.13: Van Halen @ Anz Stadium - Sydney, Australia - DISCUSSION/REVIEWS, etc. POST-SHOW DEPRESSION THREAD: VH has come & gone thru your area & now you're jonesing! 06.26.12: Van Halen @ New Orleans Arena - New Orleans, LA - DISCUSSION/REVIEWS, etc. 05.05.12: Van Halen @ Tacoma Dome - Tacoma, WA - DISCUSSION/REVIEWS, etc.